digital photos, PowerPoint (boo), and online web albums (yay!) | "geeWHIZ"
Our first mistake was adding them to a PowerPoint file, adding already huge digital files to an even larger presentation file that adds its own unnecessary bytes to the files. Even if you think you’re helping to shrink the file by cropping the photo or “dragging the handles” to shrink the photo’s visible physical dimensions, you’re mistaken. Neither cropping nor resizing do anything to the embedded photo’s digital size. Only by “optimizing” each photo in PowerPoint will you make any dent, and who among us remembers to take that additional step in PowerPoint? Right-click on a photo > Format Picture > Picture tab > Compress. Here’s a screen capture from PowerPoint 2003 showing the dialog box and its correct settings to do that. And, did I mention that each of these photo manipulation and optimization steps takes time, time that someone should be spending on other business-critical projects? Our second mistake is attaching that PowerPoint file to an email and sending it out to 200 people! Now, we’ve harbored a hideously huge file and mucked that mess across our network, replicating our ridiculous mistake in everyone’s Inbox, dramatically doing damage to Outlook Exchange server performance, and forcing our users to fling that email to file-13 to make room for other incoming messages. Today’s solution? Upload the photos online to a digital photo album, and direct our audience to that link. (Oooh, so obvious, using a solution that’s designed for the intended result!) No more overweight overhead added by Oh-mighty PowerPoint. No more duplication of those dumb files in everyone’s inbox. No more grumbling, fumbling, or mumbling by users as they no longer have to sit through some arbitray timing of slide animations and PowerPoint page builds. No more expletives by users as they try to extract key photos from the PowerPoint file. Here are some final tips for implementing this solution. Be sure to choose an online photo album service that has built-in slideshow features, so the audience can view the show at their leisure, at their pace. Be sure the online service allows a user to download a selected photo. Now, I’m not here to officially endorse one online photo album product or service over another. I’ll let you make your own decision based on the professional reviews such as the PC World review and About.com’s top ten list. 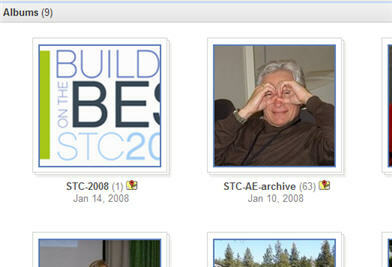 If you’re a co-worker chancing upon this blog entry, and you’re curious what some of these photos look like in their online web album, be sure to visit “STC-2008-related” articles on our intranet. This entry was posted in Helpful, Intranets, Presentations, rants, Technology by geewhizkid. Bookmark the permalink.